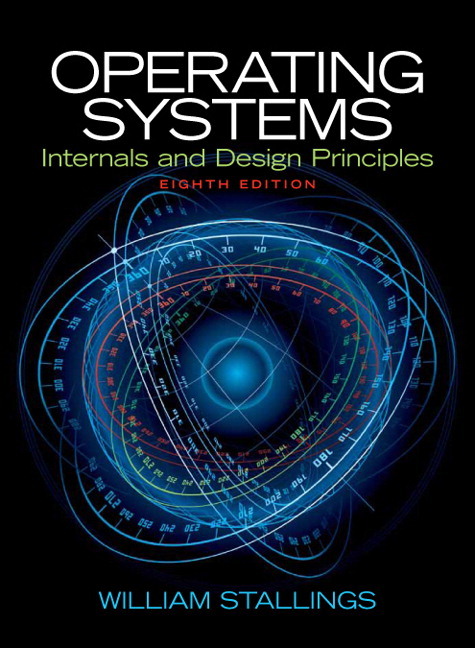 Operating Systems: Internals and Design Principles provides a comprehensive and unified introduction to operating systems topics. 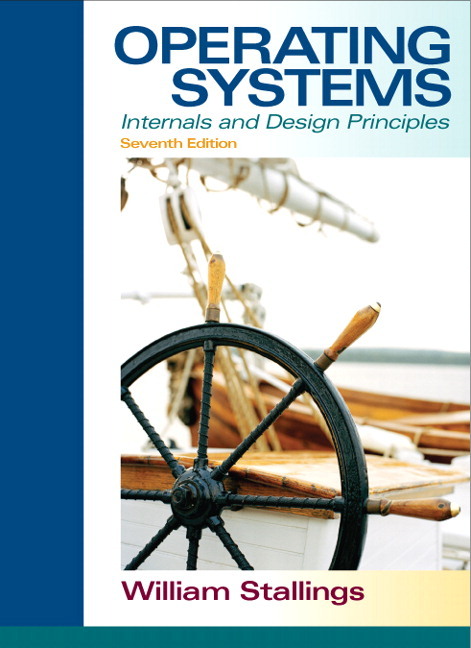 Stallings emphasizes both design issues and fundamental principles in contemporary systems and gives readers a solid understanding of the key structures and mechanisms of operating systems. He discusses design trade-offs and the practical decisions affecting design, performance and security. The book illustrates and reinforces design concepts and ties them to real-world design choices through the use of case studies in Linux, UNIX, Android, and Windows 8. Running case studies, focused on how specific operating systems implement specific concepts, are embedded throughout the text rather than assembled as a single chapter or appendix. Design concepts discussed in a given chapter are immediately reinforced with real-world examples. For convenience, all of the material for each of the example systems is also available online. NEW! Windows 8: A multitasking operating system for personal computers, workstations, servers, and mobile devices. This operating system incorporates many of the latest developments in operating system technology. In addition, Windows is one of the first important commercial operating systems to rely heavily on object-oriented design principles. This book covers the technology used in the most recent versions of Windows, known as Windows 8. NEW! Android: Android is tailored for embedded devices, especially mobile phones. Focusing on the unique requirements of the embedded environment, the book provides details of Android internals. UNIX: A multiuser operating system, originally intended for minicomputers, but implemented on a wide range of machines from powerful microcomputers to supercomputers. Several flavors of UNIX are included as examples. FreeBSD is a widely used system that incorporates many state-of-the-art features. Solaris is a widely used commercial version of UNIX. Linux: An open-source version of UNIX that is now widely used. All of this material is cross-referenced with appropriate sections in the book, so that the student can read the textbook material and then do the corresponding OS/161 project. Simulation Projects: The IRC provides support for assigning projects based on a set of seven simulations that cover key areas of OS design. The student can use a set of simulation packages to analyze OS design features. The simulators are all written in Java and can be run either locally as a Java application or online through a browser. The IRC includes assignments to give to students, telling them specifically what they are to do and what results are expected. Kernel projects: The IRC includes complete instructor support for two different sets of Linux kernel programming projects, as well as a set of kernel programming projects for Android. NEW! Linux kernel projects: The seventh edition included instructor support for kernel programming projects, both independent of any specific OS and projects that used Linux kernel concepts. In addition to continuing to provide these project assignments, this new edition provides complete instructor support for two different sets of Linux kernel programming projects. The sets are independent of one another and the two sets are of varying degrees of complexity and length, allowing the instructor to choose the depth and amount of student effort to be devoted to learning OS concepts by doing Linux kernel projects. NEW! Android kernel projects: Complete instructor support is provided for teaching core OS concepts by assigning kernel development projects using Android. Programming projects: Two major programming projects, one to build a shell (or command line interpreter) and one to build a process dispatcher, are included. The text describes the projects, and step-by-step exercises are included at the Instructors Resource Center. The exercises can be uploaded to the instructor’s Web site. Discussion topics: These topics can be used in a classroom, chat room, or message board environment to explore certain areas in greater depth and to foster student collaboration. In addition, information is provided on a software package known as BACI that serves as a framework for studying concurrency mechanisms. NEW! Embedded Linux: The use of a minimal version of Linux for embedded systems has grown in popularity. This new edition provides an overview of the key elements of the embedded Linux approach. NEW! Virtual machines: Server virtualization and other forms of virtual machines are becoming increasingly widespread. A new chapter deals with the operating system design issues for virtual machines. NEW! Multicore design issues: The dominant computer architecture is now multicore. This raises new OS design issues that are addressed in this new edition. NEW! I/O standards: The book has been updated to reflect the latest developments, including Thunderbolt. NEW! Storage hardware: The discussion of storage hardware has been updated and now includes discussion of solid-state drives. NEW! Fault tolerance: The ACM/IEEE Computer Science Curricula 2013 lists fault tolerance as one of the core topics for an OS course. A new section provides an overview of fault tolerance. The major goal of this text is to make it as effective a teaching tool for this fundamental yet evolving subject as possible. Solutions manual: Solutions to end-of-chapter Review Questions and Problems. Projects manual: Suggested programming projects that cover a broad range of topics and that can be implemented in any suitable language on any platform. VideoNotes on concurrency: Professors perennially cite concurrency as perhaps the most difficult concept in the field of operating systems for students to grasp. The edition is accompanied by a number of VideoNotes lectures discussing the various concurrency algorithms defined in the book. Sample syllabuses: The text contains more material than can be conveniently covered in one semester. Accordingly, instructors are provided with several sample syllabuses that guide the use of the text within limited time. These samples are based on real-world experience by professors with the seventh edition. Links to Web sites for other courses being taught using this book. Sign-up information for an Internet mailing list for instructors using this book to exchange information, suggestions, and questions with each other and with the author. For this new edition, a substantial amount of original supporting material for students has been made available online, at two Web locations. Companion Web site: A list of relevant links organized by chapter and an errata sheet for the book is located at www.WilliamStallings.com/OperatingSystems (click on Student Resources link). Online chapters: To limit the size and cost of the book, two chapters of the book, covering security, are provided in PDF format. Online appendices: There are numerous interesting topics that support material found in the text but whose inclusion is not warranted in the printed text. A total of 18 online appendices cover these topics for the interested student. Animations: Animations provide a powerful tool for understanding the complex mechanisms of a modern OS. A total of 53 animations are used to illustrate key functions and algorithms in OS design. The animations are used for Chapters 3, 5, 6, 7, 8, 9, and 11. Windows 8: Windows 8 is Microsoft's latest OS offering for PCs, workstations, and servers, which includes a number of changes to the internal architecture. The new edition provides details on Windows 8 internals in all of the key technology areas covered in this book, including process/thread management, scheduling, memory management, security, file systems, and I/O. Android operating system: Android is the fastest growing mobile platform. The real-world constraints and operating environment of mobile devices are quite different from traditional desktop or server computers. It is important for students to learn this new environment. Android kernel projects: Complete instructor support is provided for teaching core OS concepts by assigning kernel development projects using Android. Linux kernel projects: The seventh edition included instructor support for kernel programming projects, both independent of any specific OS and projects that used Linux kernel concepts. In addition to continuing to provide these project assignments, this new edition provides complete instructor support for two different sets of Linux kernel programming projects. The sets are independent of one another and the two sets are of varying degrees of complexity and length, allowing the instructor to choose the depth and amount of student effort to be devoted to learning OS concepts by doing Linux kernel projects. Embedded Linux: The use of a minimal version of Linux for embedded systems has grown in popularity. This new edition provides an overview of the key elements of the embedded Linux approach. Virtual machines: Server virtualization and other forms of virtual machines are becoming increasingly widespread. A new chapter deals with the operating system design issues for virtual machines. Multicore design issues: The dominant computer architecture is now multicore. This raises new OS design issues that are addressed in this new edition. I/O standards: The book has been updated to reflect the latest developments, including Thunderbolt. Storage hardware: The discussion of storage hardware has been updated and now includes discussion of solid-state drives. Fault tolerance: The ACM/IEEE Computer Science Curricula 2013 lists fault tolerance as one of the core topics for an OS course. A new section provides an overview of fault tolerance. 3.1 What Is a Process? Online chapters, appendices, and other documents are Premium Content, available via the access card at the front of the book. William Stallings has made a unique contribution to understanding the broad sweep of technical developments in computer networking and computer architecture. He has authored 17 titles, and counting revised editions, a total of 41 books on various aspects of these subjects. In over 20 years in the field, he has been a technical contributor, technical manager, and an executive with several high-technology firms. Currently he is an independent consultant whose clients have included computer and networking manufacturers and customers, software development firms, and leading-edge government research institutions. He has received the award for the best Computer Science textbook of the year ¿seven times from the Text and Academic Authors Association. As evidence of his commitment to providing a broad range of support to students, Bill created and maintains the Computer Science Student Resource Site at WilliamStallings.com/StudentSupport.html. This site provides documents and links on a variety of subjects of general interest to computer science students (and professionals). He is a member of the editorial board of Cryptologia, a scholarly journal devoted to all aspects of cryptology. He is a frequent lecturer and author of numerous technical papers. His books include Data and Computer Communications, Ninth Edition (Prentice Hall, 2011), which has become the standard in the field. Dr. Stallings holds a PhD from M.I.T. in Computer Science and a B.S. from Notre Dame in electrical engineering.